Players are now bagging up their chips for the night. A full list of the Day 1 players that advanced will be posted in the next few hours, along with seating assignments. Players will now play four more hands before bagging up for the night. They will return tomorrow at 11 am to play Day 2. The final level of the night has just begun. Players will play the next 60-minutes and then will bag up their chips for the night, and return for Day 2 tomorrow at 11 am. There are just 22 players remaining in the Super Stack Turbo event, with 21 of them getting paid. Hand-for-hand play will continue until we lose one player, and all remaining players will be in the money and guaranteed at least $583. Two of the notables still in the field are Corbin Avery and Luis Vazquez. Players are just returning from their last break of the night. The hand right before the break resulted in Nick Pupillo scooping a huge pot, after he sent Caleb Clarke to the rail. With the board reading Q♥6♣4♣7♥7♦, Clarke bet 26,000 in the small blind, Alex Karnaos called in the big blind, and Nick Pupillo moved all in from the hijack. Clarke thought for over a minute before moving all in for less (around 70,000 total), and Karnaos opted to fold. Pupillo had rivered a full house holding 6♥6♠, and Clarke mucked his hand without showing before walking away from the table. Pupillo is now sitting with the largest stack in the room, and is the first player to cross over the 200,000 chip mark. Ricky Guan opens to 1,300 from under the gun. The button calls, as does Kenneth Rawlinson in the big blind. The flop comes K♣10♥6♦. It checks around. It also checks around when the turn comes the 5♦. The river brings the 8♠. Rawlinson checks. Guan bets 2,650, the button folds, and Rawlinson goes into the tank. Over a minute and a half pass before Rawlinson calls. Guan turns over 8♣8♦, having rivered a set, and Rawlinson mucks his cards without showing. Guan is now sitting with just over starting stack (30,000). There is around 2,000 in the middle, and the board reads J♦5♣4♣. 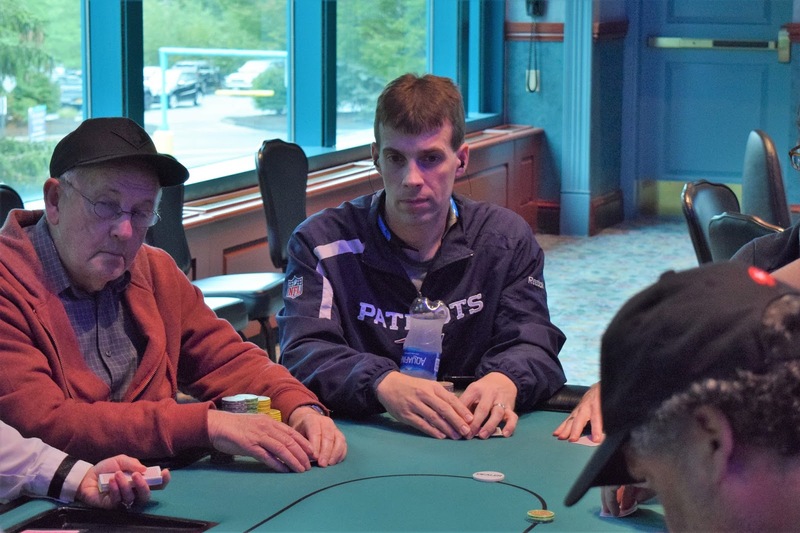 The player in the big blind checks, and Kurt Lichtman bets 1,500. The big blind raises to 6,000, and Lichtman calls. The turn is the 3♥. This time, the big blind moves all in, and Lichtman asks for a count. Upon hearing the 16,375 total, Lichtman calls. The big blind turns over 2♦2♠ for a pair of twos and an open-ended straight draw. Lichtman shows A♥J♠ for top pair. The river is the 5♥, and the big blind is eliminated from play. There were a total of 200 entries in today's $250 NLH super stack turbo event. Those entries generated a prizepool of $41,710, with 21 spots making the money. Event #16 ($2,500 NLH) - Dinner Time! Players are now on a 60-minute dinner break in the Main Event. They will return at 6:30 pm, and play four more levels before bagging for the night. In ten minutes the players in Event #16 will head out on a 60-minute dinner break. They will return to play level 7, with 250/500 blinds and a 50 ante. The average stack upon return from the break will be 41,120. Nick Pupillo has been a rising star in the poker scene since 2014 when he began his series of deep runs in events across the country. Since 2014, Pupillo has managed to amass over $1,300,000 in career earnings, including one Borgata title, one Heartland Poker Tour (HPT) Main Event win, and two World Series of Poker (WSOP) Circuit rings. To say the Illinois native has been on a run as of late would be a grave understatement. 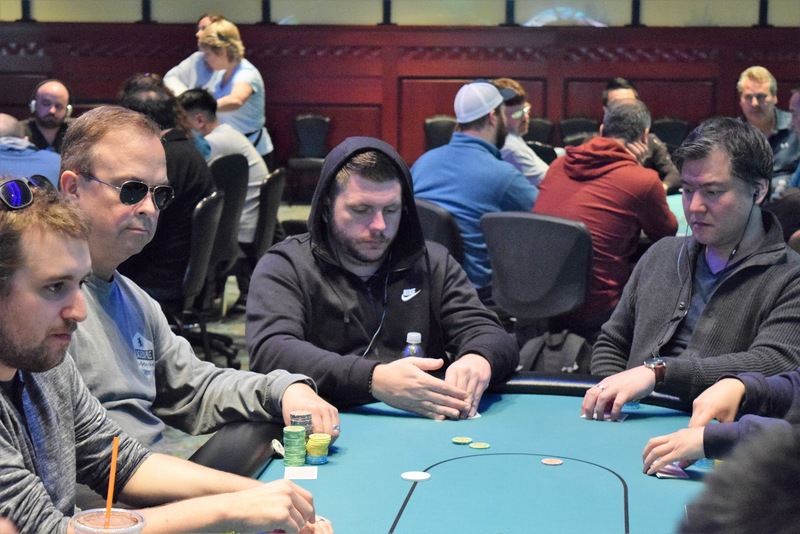 In the last month alone, Pupillo has added over $400,000 to his career earnings after taking 2nd place in the $600 NLH Borgata Deepstack Kick-Off event for $217,535, 37th in the $3,500 Borgata Main Event for $12,320, and winning the $1,675 World Series of Poker Circuit Main Event at Thunder Valley for $170,286. While Pupillo has quickly climbed the ranks to become a very well known player in the poker world, he is making his debut performance here at Foxwoods Casino in today's $2,500 Main Event. He is looking to add a coveted Foxwoods World Poker Finals globe trophy to his already well-decorated display case. We are in the midst of the third level of play for the $2,500 Championship event, and we are off to a strong start. There are already 119 entries, and registration remains open until the start of play on Day 2. So anyone wishing to enter or re-enter this tournament has until the start of play on Day 2 (11 am Sunday Oct. 15th) to do so. Day 3 will be played to a conclusion/winner. Edward Kaufman moved all in for 520,000 in the small blind, and Frank Melgar called in the big blind. "It's the only face card I have seen in a while," Kaufman says as he turns over K♣10♠. The board runs out Q♣Q♦2♦6♦Q♥. Melgar's ace high will win the pot, and Kaufman is eliminated in 3rd place, taking home $4,000 after the players' chop deal.